Lee Mims. Trusting Viktor. Woodbury, MN: Midnight Ink, 2014. Cleo Cooper has a good relationship with her ex-husband, Franklin Donovan Cooper IV (“Bud”). Cleo is a well known and well compensated economic geologist, but Bud still feels the need to watch out for her interests. At Bud’s suggestion, Cleo has invested in a company that is exploring for natural gas off the North Carolina coast. This was supposed to be just a financial investment for Cleo, but when the company fires most of its geologists, Bud pulls Cleo in to use her expertise in a way that protects their investments. Cleo does not relish a helicopter ride out to the drill ship, but the ride itself becomes the least of her problems. The drilling operation is clearly in flux, Cleo gets mixed signals about who is in charge, and soon after she arrives she is attacked by an unknown assailant. Cleo is grateful that her stay on the rig is a short one. 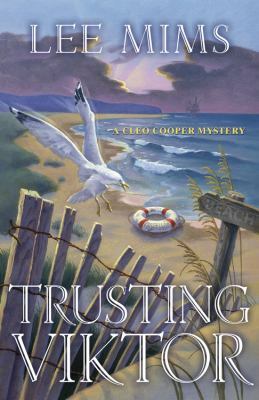 When the body of a man who might have been her assailant washes up on the sands of Atlantic Beach, Cleo is visited by the police. Cleo cannot be sure the dead man was her attacker but when she looks at his body, she sees something that might implicate Bud in the man’s murder. Soon Cleo is back on the drilling ship–for personal and professional reasons. She’ll soon find that there is more than one kind of treasure beneath the ocean waves. This well plotted mystery will be of special interest to readers who know North Carolina’s history–both the recent saga of offshore energy exploration and story of how German U-boats prowled along our coast during World War II. This is the second Cleo Cooper mystery. The first title in the series is Hiding Gladys. Reynolds Price. Kate Vaiden. New York: Atheneum, 1986. From the Scribner Paperback Fiction (1998) edition. Considering how I was soon to behave, I have to wonder if I ever really loved him. I’d shown most other human instincts till then. Why did mothering fail me? At age 11, Kate Vaiden makes a vow to her mother Frances never to become a mother. In a sense, she never does. Although Kate gives birth at 17 to a son named Lee, she leaves him behind with her extended family. Forty years later, Kate begins to wonder what happened to Lee. If he is still alive and well, Lee is forty, and at Kate’s best estimation, he has made his way in the world without her. She believes it is unlikely that Lee would need or want her in his life at this point. For all intents and purposes, Kate kept good on her promise. By abandoning her son, it’s as if she never bore him at all. Yet there are questions hanging over her her, the first: Who is Lee Vaiden? Frances’ closeness with her family created a source of tension between her and Dan. When Frances’ nephew Traswell dies, she takes Kate home to Macon to attend the funeral, but Dan stays behind. After the funeral, Dan unexpectedly shows up in Macon. He arrives while Frances and another nephew have gone to Traswell’s grave. Dan drives to the cemetery, and without warning, shoots Frances and himself. Up to that point, Kate had believed that she had a happy childhood, irrespective of any strain between Frances and Dan. Following her parent’s murder-suicide, she is left under the care of Frances’ sister Caroline and her husband in Macon. From there, the novel follows Kate from adolescence to middle-age. Kate struggles to form any sort of lasting commitment or attachment to another person. During her formative years, what Kate loved left her. As a young woman and adult, she becomes a quitter. Whenever things get serious, Kate bolts. Single and fifty-seven years old, she’s an eternal orphan. Kate Vaiden is the story of Kate’s life, as told by Kate in hindsight. Parents, family, and home are contentious topics for Kate. Her residual questions about her mother and lingering questions about her son influence her life. 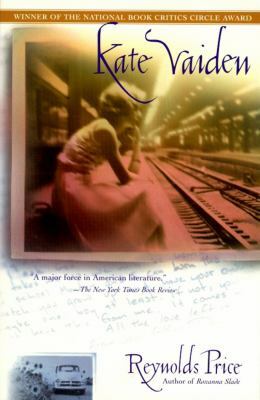 In regard to Lee, Kate regrets that her “baby-making machinery works” but “when they made me, they left out the mothering part.” Price creates a flawed protagonist in Kate who is good at hurting others and has been hurt in turn. Despite all her imperfections, Kate’s engaging and entertaining voice smooths over her less attractive qualities and makes her situation more sympathetic. The novel earned Price, who was a novelist, poet, and English professor at Duke University, the National Book Critics Circle Award. Lisa Wingate. The Prayer Box. Carol Stream, IL: Tyndale House, 2013. Ninety-one year-old Iola Anne Poole doesn’t have the best reputation. The people of Fairhope regard her as a hermit and a squatter. Word around town is that Iola wormed the Benoit House away from its rightful owners. Girard Benoit’s nephews intended to sell the estate to a group of locals who had grand plans to turn the Victorian house into an upscale beach resort on Hatteras Island. But supposedly Iola intervened and manipulated the old Mr. Benoit, who was not in a clear frame of mind. Or so the story goes. Meanwhile, thirty-three year-old Tandi Jo Reese has recently started renting Iola’s nearby cottage. Desperate and down on her luck, Tandi fled from an abusive and criminal husband with her two children, JT (age 9) and Zoey (age 14). Without a home, the cottage was the best deal Tandi could find, apart from sleeping in her car. But her money is running out. The rent is already overdue and Tandi is struggling to find a job that will hire her since she is too afraid to provide any details of her former life. Tandi grew up in a family of slick smooth talkers – her father, her mother and her sister, Gina – who merge fact with fiction to get what they want. Her home life was tumultuous. Then again, it still is. Although Tandi has escaped from her husband, Trammel, she sees the disillusionment in her kids’ faces. Up until Tandi decided to leave, she hadn’t been the world’s greatest mom. After an accident, she became hooked on Oxycontin and walked around in a doped up haze. Because of her tough upbringing and her abusive husband, Tandi hasn’t trusted anyone in a long time, if ever. Now JT and Zoey’s faith in their mother is wavering. One day, not long after Tandi and her kids have moved into the cottage, she notices a suspicious lack of movement in Iola’s house. When she investigates, she finds Iola’s body lying peacefully in a bed. At first, Tandi is worried that hubbub surrounding Iola’s death might draw notice to the fact that she’s behind on the rent. But Tandi isn’t aware of Iola’s general unpopularity around Fairhope. Tandi’s financial woes aren’t a complete secret though. One of the lay people at the Fairhope Fellowship Church strikes a bargain with Tandi: she will clean out Iola’s house in exchange for her rent. Tandi accepts the deal. But it isn’t an easy job. The house has been damaged by the most recent hurricane. Architecturally, the house is unsound. Buckets are scattered throughout the rooms to catch dripping water. And Iola hoarded a massive stockpile of food from home grocery deliveries. Canned goods flooding out of the pantry shock Tandi, especially since she can barely afford food for JT and Zoey without skipping meals herself. However, the prayer boxes are the best surprise that Tandi stumbles upon. If you’re not familiar with the concept of a prayer box, check out this blog entry by Lisa Wingate on making and using prayer boxes. The basic concept behind a prayer box is to create a box or decorate a pre-existing box, which the owner will fill with prayers and reflections, or even favorite scriptures. Every year, for eighty-one years, Iola fashioned a prayer box and filled it with letters to her father. As Tandi combs through the boxes she relates the struggles in Iola’s life to her own. Strangely, the lessons in Iola’s letters resurface and guide her through this trying chapter in her life. And in the process, Tandi discovers that Iola was not the woman that many presumed her to be. David James. 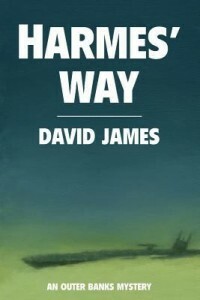 Harmes’ Way. United States: River Farm Books, 2012. Ben Harmes is an Outer Banks native, but he spent most of his adult life working as a policeman in Boston. After his wife’s death, an ill-advised second marriage, and over zealous interest in a politically sensitive case, Ben has washed back up on the North Carolina coast. His daughter Kate, a state park ranger, provides good company, as do a number of easy-going, beer-drinking locals. One of those locals is Charlie Evans, a good ol’ boy who matches Ben drink for drink. Charlie can take it easy because his underwater filming company made good money from its part in the recovery of gold from a downed German U-boat just off the coast. As Harmes’ Way opens Ben, hung over, is rushing to meet Charlie for some early morning surf casting. When Ben finds Charlie’s SUV, rod, and waders, but no Charlie, his policeman’s instincts kick in. Even though the sheriff’s deputy suspects nothing more sinister than an accidental drowning, Ben begins to nose around. He learns from Charlie’s business partner, Sophie Carson, that two men associated with the U-boat film project died under suspicious circumstances just a few months back. Then Sophie’s house is bombed. Sophie survives, and she teams up with Ben in a adventures that moves across North Carolina from the Outer Banks, to Wilmington, to Grandfather Mountain, to 100 feet below the surface of the ocean off Hatteras Island. Robert Morgan. The Road from Gap Creek. Chapel Hill: Algonquin Books, 2013. Life hasn’t gotten any easier for the Richards family. Time has only moved onward. 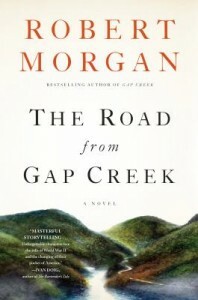 In his sequel to Gap Creek, novelist Robert Morgan looks to the next generation to forge the way in The Road from Gap Creek. Annie Richards Powell replaces her mother, Julie Richards the original narrator of Gap Creek. Annie recounts snapshots of the Richards family during the Great Depression and World War II. Readers are punched hard and early on with the death of Julie and Hank’s favorite son, Troy. The news devastates the family. Troy volunteered in the Civilian Conservation Corps where he met a recruiter for the Army Air Corps. The Army sent Troy to work on a base in Georgia. He reassured his family that he wouldn’t get sent into active duty. Until the Army shipped him off to England. Annie, upon the news of Troy’s death, is propelled into the past. She recollects the family’s history in a stream of events: the move from Gap Creek to Green River, Troy’s beloved dog, Old Pat, and later Troy’s less accepted fiancée, Sharon, Velmer’s typhoid fever, fallout from the Depression, acting in high school plays, church life, bootleggers. Morgan does not adhere to chronological order, as he shifts between Annie’s recollections and present day. Her stories aren’t arranged in a strictly logical sequence. Rather, they present the effect of a patchwork memory. Morgan deftly combines Annie’s string of loosely collected memories, so that stories that seem like confined events later make sense in the scheme of the family’s history. He evokes a true feeling of everyday life where the characters on the page have breath and a pulse. But most convincingly of all, Morgan depicts the force of family. Annie emphasizes the lack of opportunity in dead-end Green River, for herself and for Troy. She dreams of acting, traveling elsewhere, and owning fine clothes. She wants out of Green River. But when she’s offered the chance to model, possibly legitimate, possibly a scam, Annie never finds out. During that moment, she realizes she couldn’t leave her family that depends so much on her behind. Annie does not exist in isolation; she is a strand in the Richards family web. This fact becomes much truer and resonates much stronger when Annie begins her own family. The microcosm of the Richards family and its history echoes that of people and history at large. Fans of Gap Creek will enjoy this chapter of the Richards family’s struggles and joys, but newcomers will be equally charmed by Morgan’s naturalistic story-telling. Morgan could write the Gap Creek saga ad infinitum. It’s a slice of life, and an interesting one to dig into. The Road from Gap Creek observes a period of momentous and irrevocable change in American history, and the Richards family history. Check out this title in the UNC-Chapel Hill Library catalog. Shelley Pearsall. Jump into the Sky. New York: Alfred A. Knopf, 2012. Change is nothing new to thirteen-year- old Levi Battle. He is well acquainted with getting passed around and traded off among relatives. His mother, Queen Bee Walker, a beautiful but demanding jazz singer, abandoned Levi as an infant in an old Ford in the parking lot of a jazz club because she was dissatisfied with her unglamorous lifestyle and the weight of her maternal obligations. His father, Charles Battle, left Levi behind to serve as an army lieutenant in World War II. By contrast to his family, Levi views himself as a person who sticks around, even though his relatives are constantly shifting. In his father’s absence, Levi lived first in the custody of his grandmother. Upon her death, he was transferred to the care of his Aunt Odella. The novel begins in the spring of 1945. 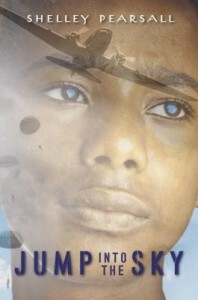 After three years of housing her nephew, Aunt Odella has decided that since the war is almost over, the time has arrived for Levi to depart Chicago and reconnect with his father who is stationed in Fayetteville. Truth be told, she is tired of her charge and wants a reprieve from her responsibility. For three years she has slept on a cot in her living room to make space for Levi in her cramped apartment. With the end of the war in sight, Aunt Odella sees the opportunity for her personal liberation too. So Aunt Odella packs Levi onto a train from Illinois to North Carolina with a suitcase and a bag of fried chicken. Levi is panic-stricken. He fears that he will arrive at his father’s army post unwanted. As the train travels further South, Levi faces another unexpected trouble as well–racism. Before relocating, Levi was unaware of the full extent of regional differences toward race. He is unaccustomed to the open hostility that he meets in the South. On his route and upon his arrival to North Carolina, he makes a couple of honest faux pas that do not jibe with the laws of Jim Crow. In one hard lesson, a shopkeeper threatens Levi’s life when he asks for a Coca-Cola. Following that encounter, Levi understands Southern racial etiquette with greater clarity. With a little bit of luck, Levi manages to arrive unharmed in Fayetteville only to discover that his father’s unit has moved out to a new, undisclosed location. Yet again, he has been deserted, albeit unintentionally. The people in Levi’s life do not appear to discard him totally out of malevolence. Outside factors seem to nudge between Levi and his family and snip the ties. During his time in North Carolina, Levi encounters an old sweetgrass basket weaver named MawMaw Sands who teaches him that at the center of every basket is “a knot of pain” that anchors its foundation. In MawMaw Sands’ opinion, pain and sweetness are interwoven in life. Levi’s life appears knotted with an especially large amount of pain. His challenge is to clutch at the sweetness he can find and braid it in, no matter the struggle. Novelist Shelley Pearsall sends Levi on a journey to unexpected locations across the country in pursuit of his father. Family, is not so easily found or established, and, as Pearsall reveals, these bonds must sometimes be learned anew. This book is intended for children and young adults, however, Pearsall’s memorable characters and witty narrator could hook readers of any age. Additionally, the portrayal of racism from Levi’s adolescent and unfamiliar perspective is poignant in its genuine and innocent surprise. Rhonda Riley. 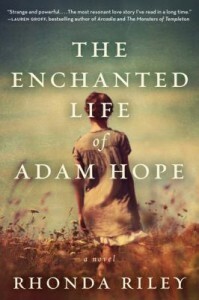 The Enchanted Life of Adam Hope. New York: Ecco, 2013. After her Aunt Eva passes away, seventeen-year old Evelyn Roe is charged by her parents to tend to her deceased aunt and uncle’s farm near the fictional town of Clarion, North Carolina. The farm lies twenty-five miles outside of Charlotte. Riley’s story begins at the end of World War II and most of the town’s men are off fighting, if they have not already perished in the wake of the war effort. With their work at the cotton mill, Evelyn’s parents do not have time to look after the farm. Despite her initial shock at the responsibility, Evelyn quickly adapts to her new circumstances and finds freedoms alongside her obligations. Thanks to her height, her red hair, and her smattering of freckles, Evelyn is teased mercilessly. Like many small towns, Clarion does not take kindly to differences. But on the farm, she develops a loving bond to her family’s land. On the farm, Evelyn happens upon something odd — a man lodged in the harsh, red clay earth. Evelyn rescues and cares for the disfigured man. Yet the unknown, unnamed man is not what he seems. He possesses strange talents that verge on supernatural. Evelyn and the man who eventually transforms into Adam Hope fall in love. Their connection is profound, both spiritual and sensual. They marry and start a family. The town of Clarion accepts Adam unequivocally. They appreciate his kind heart, large appetite, and earthy nature. At first. After a tragic incident brings grief to the Hope family, Adam’s unusual behavior elicits discomfort and draws questions from the townspeople. Suddenly, the Hope family finds their way of life endangered. Will Evelyn and Adam be able to restore their standing in the community and maintain their intimate bond? Or will the stress of prying public opinion unravel the Hope family? 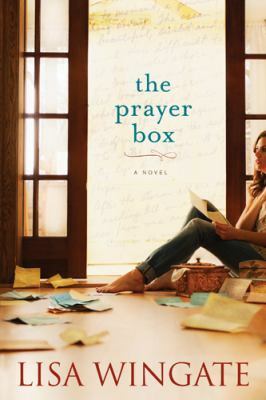 First-time novelist Rhonda Riley presents a story with biblical undertones that focuses on unwavering love and that experiments with concepts such as gender and physical manifestations of differences. Her exploration of gender in particular is at times reminiscent of Virginia Woolf’s Orlando. She highlights the subtleties and secrets that exist within families. Riley questions ancestry and if people can know one another truly. Gail Godwin. Flora. New York: Bloomsbury, 2013. Helen Anstruther does not think highly of her Alabama relative, Flora. In Helen’s opinion, Flora is simple-minded and prone to regrettable emotional outbursts. At ten, Helen feels more mature than the unrefined, twenty-two year old Flora. Helen’s father Harry, an alcoholic and sharp-tongued high school principal, is no fonder of Flora than is his daughter. But after Nonie, Helen’s grandmother and primary parental figure, passes away Harry has a problem. He intends to spend the summer in Oak Ridge, Tennessee working on a top secret military project and needs someone to watch over Helen during his absence. Flora is his deceased wife’s cousin and his only viable choice left. 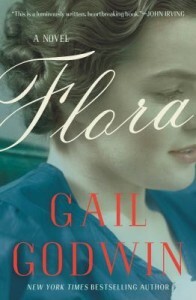 Despite her perceived shortcomings, Harry asks Flora to spend the summer at their home in a fictional North Carolina mountain town during the close of World War II. After a polio scare strikes the town, Flora and Helen remain shut away in the Anstruther house, Old One Thousand, which served previously as a convalescent home. The house is rich in material for Helen’s busy imagination. In fact, Helen’s curiosity often leads her into places she does not belong and to things that belong to others, like a series of letters exchanged between Nonie and Flora. Nonie and her father have raised Helen on a steady diet of sarcasm and disapproval. Helen finds fault after fault with Flora: her unflagging sincerity, her predilection for tears, her inability to drive. Fresh out of teachers’ college, Flora hopes to become a teacher, however her childlike nature and seeming dependence undercuts this ambition. Often Helen feels like the adult, guiding Flora and even helping her practice her skills by creating an imaginary classroom. Helen is a precocious child and has an acute awareness that Flora longs for her approval. Although Helen expresses contempt toward Flora, the two develop a fast friendship with their Irish grocery boy, Finn, that creates an uneasy triangle. By the end of the summer, those tense relationships reach a breaking point. Godwin situates the novel from Helen’s perspective, as child and as adult. With the perspective of adult Helen, the book possesses an elegiac tone. The novel edges toward a coming-of-age story, except that the lessons come late to Helen, who mourns that as a child she missed the complexity of Flora’s true character. Godwin creates vivid yet realistic characters shaded through the eyes of Helen. She also depicts how children are influenced and shaped by their elders, for better or for worse. This book, like many of Godwin’s novels, is set in Mountain City, which is widely thought to be modeled on the author’s hometown of Asheville, North Carolina. There are some instances of racist language and dialogue in the book. Thomas Meinecke. Pale Blue. Las Vegas, NV: AmazonCrossing, 2012. Set in mid-1999, Pale Blue follows the thoughts of Tillman, a young German living temporarily on the Outer Banks. Fascinated by blues music, he traces its evolution through time, musing on iconic figures and significant events from Josephine Baker and World War II to Ronald Reagan and Mariah Carey. This history is interspersed with his own ethnic and sexual self-explorations, which he embarks on with the aid of Vermilion, a local waitress earning her doctorate at Duke studying Hasidic Jews. Tillman also corresponds with an old girlfriend in Germany, Yolanda. As he and Vermilion travel from Ocracoke to Kitty Hawk to Roanoke Island, we journey with them on their voyage of self-discovery and historical inquiry. 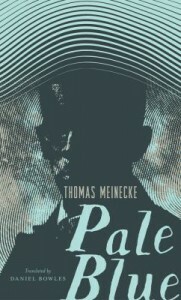 Meinecke’s second novel, translated from the German by Daniel Bowles, is a twisting path through time and narration, often switching location and speaker abruptly. Those interested in stream of consciousness writing in particular will enjoy the style of this novel. Bill Carver. Damned if We Do. Andrews, NC: Mountain Voices Publishers, 2011. In early 1945 Eric Keestler is a low-level German intelligence clerk who hopes to avoid being sent to fight the Soviets on the Eastern Front. When he is called to a meeting that includes Hitler himself, he fears the worst. He gets the worst, but it’s not what he expected. The Germans know that America is building a powerful new weapon–the atomic bomb–and they want Eric and another soldier, Wilham Pfouskt, to disrupt the research facility at Oak Ridge, Tennessee. Eric realizes that he has been chosen for the mission because he is fluent in English and familiar with American culture through his work monitoring American radio broadcasts. But why has Wilham been selected? Wilham’s bearing and attitudes lead Eric to think that he is well bred and well connected, but as their mission progresses, Eric sees the darkness inside Wilham. Within days of being dropped off on the North Carolina coast, Wilham jeopardizes the mission by his lust, greed, and cruelty. On their journey to Oak Ridge Wilham leaves a trail of abuse and death across piedmont North Carolina and on to the mountains of North Carolina and Tennessee. Even as World War II is coming to a close, so is Eric’s old life and his rosy view of human nature.